TOP LEFT: Cast Aluminum Double Lever. No Marks. Very smooth action on this corkscrew. Ron MacLean says "Possibly Italian with a hidden aluminum (?) rack although the web helix looks more German." MIDDLE: Extra large folding medicine - 2 1/2" closed. Nickel plated brass. Decorative markings and "CLOUGH'S PATENT, JULY 22, 1884." This is one of the many Clough corkscrews that Bob Nugent had in his collection. I am pleased that I was able to keep intact Bob's Clough collection and medicine corkscrews. UPPER RIGHT: An Argentinian version of the Italian "Eterno" patented by Ettore Cardini in 1945. The Eterno is shown on page 87 of The Corkscrew A Thing of Beauty DeSanctis and Fantoni. In his 1994 Best 6, Guy Olive pictures a similar double lever marked "?ustria.e.d.e" with cap lifter at the top. Joe Balaban had one with cap lifter marked "Industria Argentina, Gaumen M. Reg." Mine is marked "Elesan / Mar. Reg. / Industria Argentina." Also see Victor Fouque's 1947 patent in Guy Olive's French Corkscrew Patents. LOWER LEFT: A simple wire corkscrew with button finished with a hook for hanging on a nail. LOWER MIDDLE: Tongs marked "Pat. Pend. D. Arnof, N.Y.C." Arnof filed for the "tongs" patent on July 17, 1931. U.S. Patent number 1,897,991 was issued on February 14, 1933. Twin crown cap lifter handles with the wire helix shaft crimped in place. Don Minzenmayer had one of these in his 1983 Best Six. 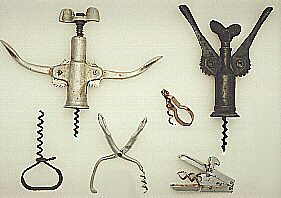 LOWER RIGHT: A folding pocket corkscrew with double helix. Nickel plated steel stampings. When closed swivel hook slips over tab on opposite side to secure. This one came to me via my Czech connection. It looks and feels Eastern European.